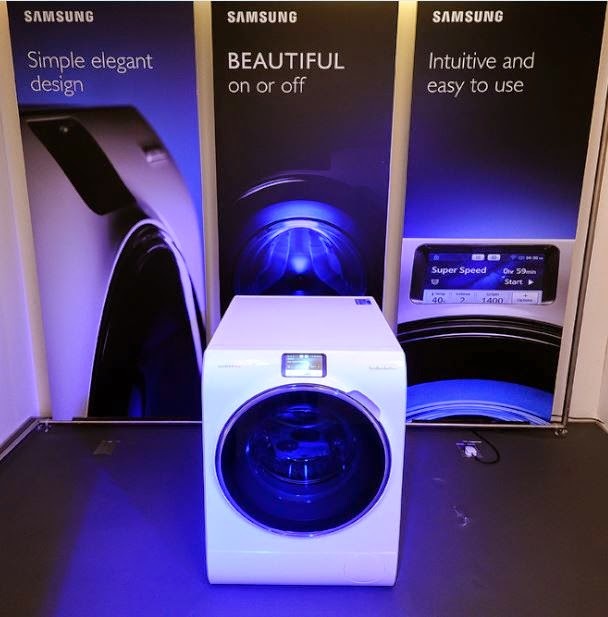 Two weeks ago I headed to John Lewis’ Peter Jones department store in Sloane Square to take a sneak peek at the brand new Samsung WW9000 Washing Machine. First off, I should tell you that this picture really doesn't do it justice, the washing machine design is sleek and streamlined and I love the attention to detail the designers have given the machine. Even so far as the circle design to the side of the machine that allows you to place it at the end of a work surface without looking bland and boring. 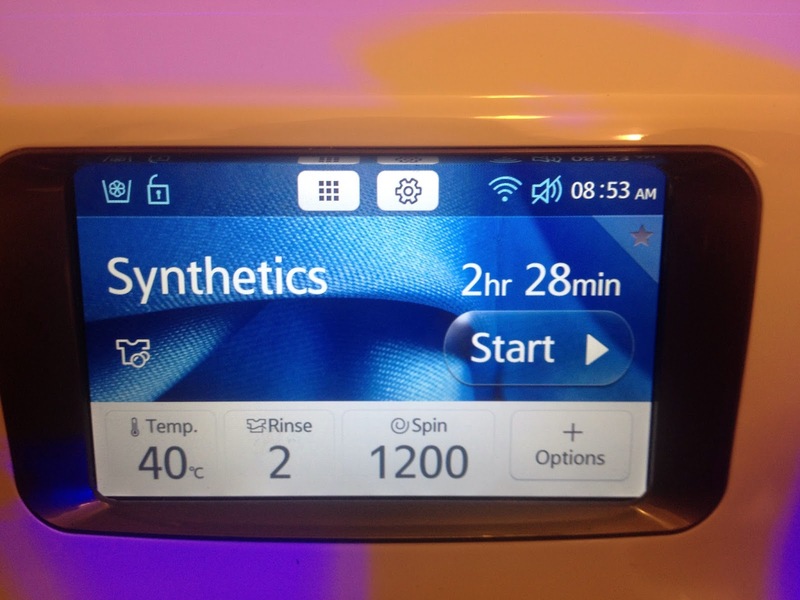 We were shown all of the incredible benefits of the machine by Nick Bevan, Senior Product Manager - Laundry at Samsung UK and Ireland and he was happy to answer all of my questions on the new machine. 1. Gather the laundry (not as simple as you may think) This usually involves emptying the laundry basket on to the floor of the landing then frantically searching the children's rooms for various socks/vests/school uniform that the children have left lurking under their beds. 2. Attempt to carry said washing load by hand (why?!) to the washing machine, dropping several socks en route like a modern day version of Hansel and Gretal dropping bread. 3. Drop washing on the floor in front of the machine then trace the steps back up the stairs to locate dropped items. 4. Search for washing up tablets..
5. Scream at the top of my voice "Chris? Where the washing tablets? I cant find them"
6. Locate washing tablet right in front of my eyes, throw it in to the machine. 8. Glance at the dial... realise I don't know what any of the settings mean. 10. Question whether I should have added an extra rinse/spin/extra washing tablet. 11. Realise I missed the one item out of the machine that needed to be washed for tomorrows ballet/athletics/swimming lesson. 12. Go off and forget that the washing load finished 6 hours ago and is now creased to death and starting to smell. 13. Sniff it...It smells... start over. The WW900 has a touchscreen rather than fiddly buttons and dials. 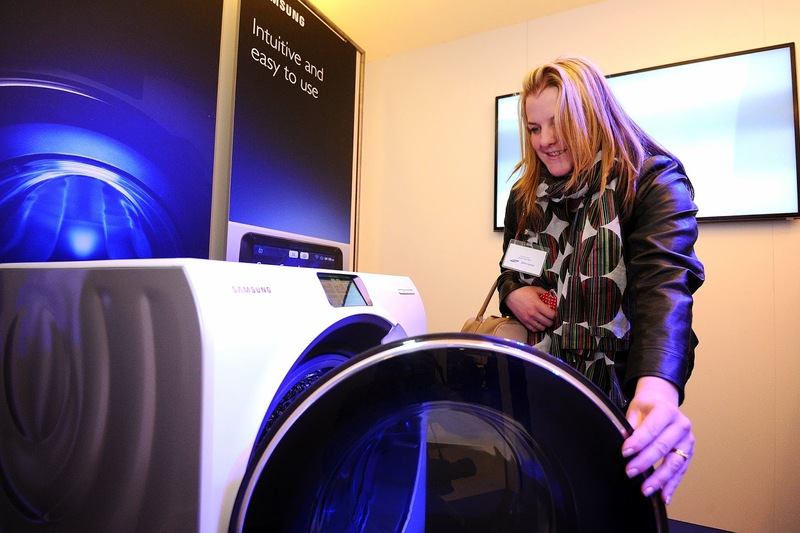 Samsung say "Every other smart device has a touchscreen - why not your washing machine?" 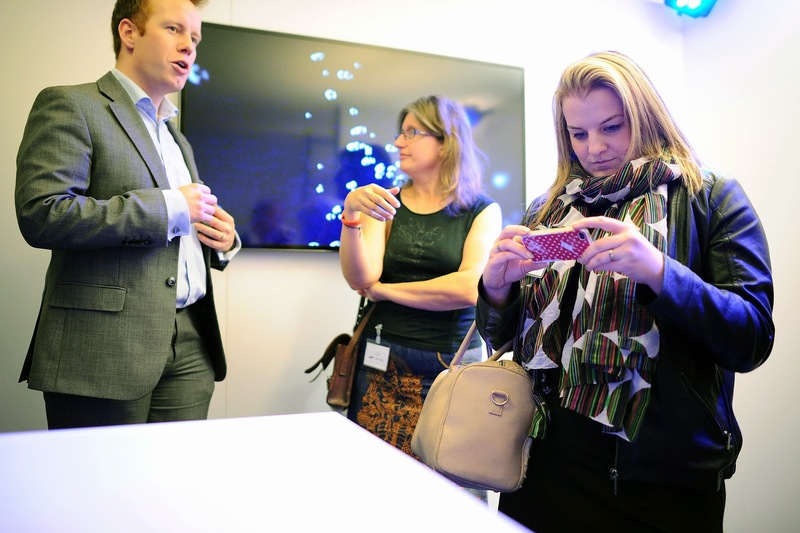 and I like their style, the 5” LED screen responds straight away with just one touch of your finger. The machine automatically shows your 'Most Used' cycle as soon as you switch it on, so if you are a one cycle wonder like me then you can start your wash with literally one tap. There are different programmes too that can be selected for every stain scenario: a 'Gardening' cycle that shifts soil and grass stains, 'Cooking & Dining' gets rid of food and grease marks, and 'Active Sports' that would be perfect for the kids' football kits. I particularly love the idea of having no detergent draw. Mine gets scummy quickly if I use powder (which is why I usually buy tablets that go straight in to the drum) and I hate cleaning it. This smart machine holds up to a month’s worth of detergent in the drum (in a similar place to the filter in your tumble dryer) and magically dispenses just the right amount you need for each load by weighing the laundry as well as sensing how soiled it is. Amazing! It has a Super Speed Wash for those items you need washed in a rush. You can wash an average load of 5kg in just 59 minutes – or a load of 2kg or less with light soiling on a 15 minute wash! If that's not enough to entice you then how do you fancy controlling your machine from your smartphone or tablet - very futuristic. With the WW9000 you can pause or start a wash using your mobile or tablet, so if you don't want to put a wash on in the morning and leave soaking in the drum all day until you get home, then you can load it in the morning and switch it on as your leaving work - that way it’s done by the time you get home. You can also get notifications telling you how long there is left and when a cycle has finished so if your snuggled up on the sofa watching your favourite soaps, then you don't need to keep getting up to check if it's finished. 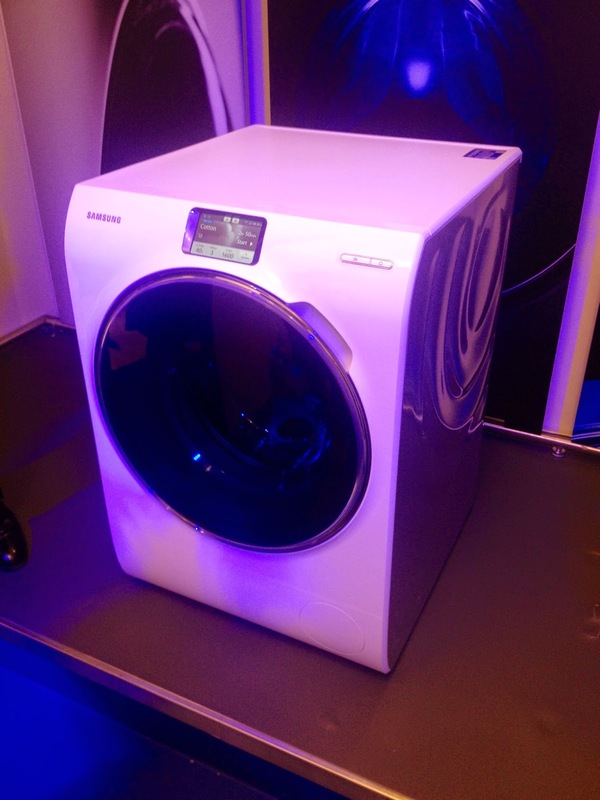 The WW9000 also uses Samsung's ecobubble technology, producing special bubbles which dissolve faster and deeper into your clothes - making them cleaner but also meaning you only have to put your laundry on a cool wash as the bubbles (rather than the heat) do all the hard work. It has a huge door with double hinges, meaning it can fully open back on itself (my current washing machine is always bashing my legs as I'm loading so this would spare me the bruises) but as a mum this also worried me as the door, combined with it's 10kg drum, could easily attract children as a hiding place. Nick assured me that safety was key - both the door and the touch screen have child locks, however, should the unthinkable 'hiding' happen then the door is easily pushed open from the inside. Finally, it’s quiet too (or so I'm told) thanks to its motor and 3D vibration sensor the machine creates minimal noise even during fast spin speeds of up to 1600rpm - so you can put a load on at night and it won't disturb your little ones. So all in all the WW9000 sounds amazing.. so much so that I decided I must have one... which is why I was a little down-hearted when I heard the £1700 price tag. Don't get me wrong, I have no doubt that this machine is worth the money but at that cost it would definitely have to be an appliance we'd need to save up for. And this is why meeting this machine has really got me thinking about the way in which we perceive our appliances - I really feel that in the future our appliances buying decisions will no longer be made out of necessity but, much like we want the best mobile with the best operating system, we will want the same for our every day appliances too. I for one really want this bad boy in my life but by the time I've saved up my pennies I'm sure that they'll have invented a robot that can load the washing and press all these buttons for me! Well, a girl can dream! 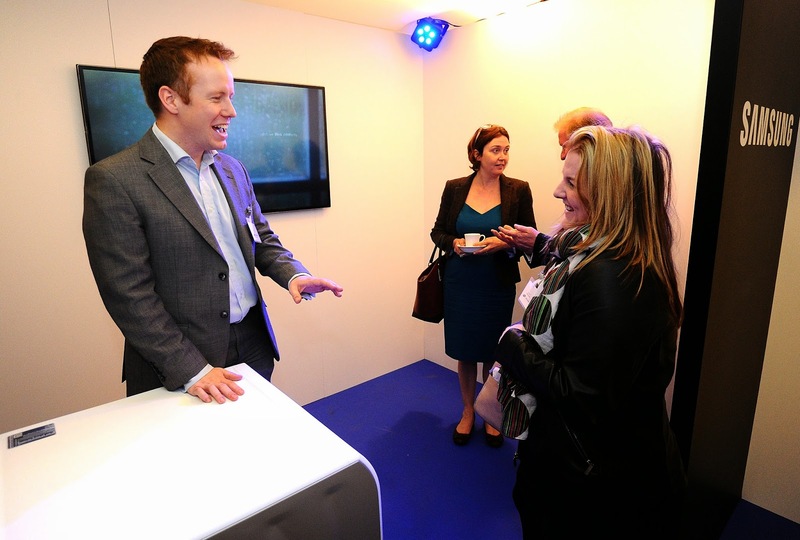 The Samsung WW900 is available now at John Lewis and at other retailers later in the year.